As my team creates new web apps and microservices in Rails, Meteor JS, and other stacks, we dockerize them. Docker is great because it enforces loose coupling, modular design, and process isolation. A Docker container can be thought of as a very lightweight VM that shares a Linux kernel with its host. The infrastructure and tooling around it makes configuration management, scaling, and efficient use of resources easier. 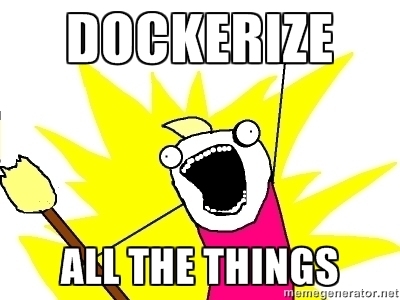 My team’s also dockerized the Informix and DB2 database servers. The direct hardware access that Docker allows will give you better performance than you’d have seen with a VM equivalent in the past, while the container format allows for easy automation, operation, and management.